If data is concentrated in fewer hands, will income inequality grow? And will this further tilt power structures? Can we measure data inequality, like Gini coefficient does to measure income inequality? 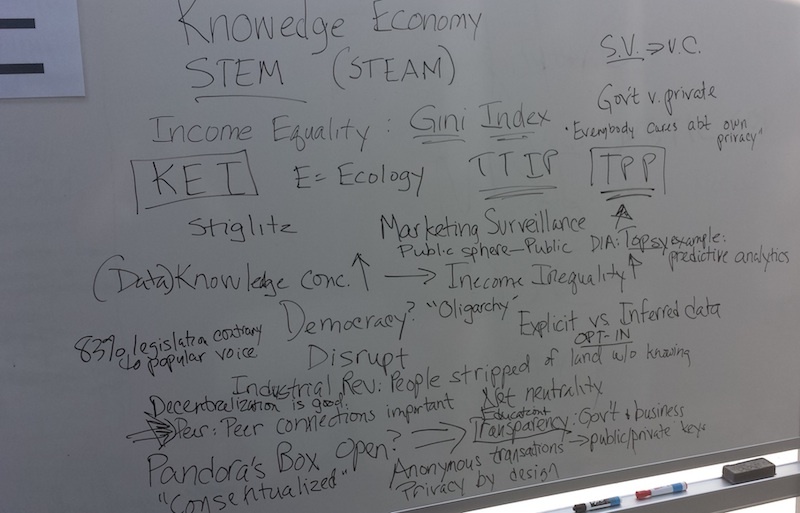 21st century post-industrial economy called knowledge or information economy. Influence on education: STEM careers (STEAM acknowledges art—creativity/innovation—as important.) Compared to industrial revolution where people were stripped of land and were unaware what happened & how livelihoods changed. Will middle class “knowledge workers” (doctors, teachers, IT, musicians, etc.) become devalued as data is gleaned and monetized by big corporations? Controversial concept. With each birth, privacy is a renewable resource! Pandora’s Box is open and data collected without our ability to opt-in or out. Decentralization with Peer to Peer connections important. Demand education and transparency of data collected by both business & government. We should not have different standards for government and private sector as they have merged. Transparency is limited by bad laws. E.g. transparency of prices in health care and trade secret laws that prevent disclosure of negotiated rates for services. There is a difference between explicit and inferred data. Marketing surveillance comes from explicit info shared on sites like facebook. Predictive analytics with data collected over which we have no control (or know exists) is concerning. Trade agreements like TPP and TTIP impact data inequality (such as who controls data for international companies; how might net neutrality be impacted). Secret trade agreements (corporations writing them) are writing them without transparency to public. Could this impact net neutrality or data ownership/access? How does this impact governance? Acknowledgement that we are an oligarchy. Recent Huff Post article that demonstrates 83% of legislation is contrary to public opinion. This page was last modified on 9 May 2014, at 16:58.